How many times have we heard that? Those who believe that arrogance precedes destruction usually have witnessed it first hand. I know I have. Every time I have believed I was really good at something, someone showed me that I wasn't really as good as I thought I was. But here I am, full of pride for what we have built at GreenRope. What am I to do? We have done what few companies have done - built a business organically, without venture capital, with years of sweat equity invested, and now serving over 2,000 clients in over 20 countries. Do I have a right to be proud of what we have done? At what point does one's pride in their work become a liability? I have been struggling with this for a while now. I look at our team, at how hard they work, and their dedication to helping our clients and being supportive of each other, and it fills me with a sense of accomplishment. Not for what I have done personally, but for what they have created. Each and every one genuinely cares about maintaining our culture of serving our clients. Our sales team puts in long days, showing our software to potential clients. And they do an amazing job - over 40% of people who create trial accounts become clients. That's over 3x the industry average for CRM software. They have a lot to be proud of. They demonstrate every day how our team of 20 people outperforms companies with thousands of employees. Our marketing team competes with companies with massive advertising and PR budgets. We can never outspend a huge company, but we can show the world how we compare to those huge companies. Websites like TrustRadius, G2Crowd, and Ombud are a great place to compare different software companies and what they offer. Our dynamic sister duo marketers take on companies with marketing teams over 10x their size through campaign management, social media engagement, and creating overall brand awareness. Our customer service team is the biggest component of our company, something I believe sets us apart. The businesses we work with are more than just clients - they are partners. I believe if we take care of them, they will take care of us. That's why we never outsource our support, and why we make sure every question is answered and not brushed off. We engage in live chats, we respond to emails, and we pick up the phone. We know how important it is to help when something doesn't make sense. Businesses rely on us every day, and we take every question seriously. So it is with a sense of humility that I say I have pride in our team. I know how hard they work, and I know why they do it - for people like you. For people who are proud of the businesses they have built and want to grow them even more. For sales and marketing professionals, trying to figure out a better way to do their jobs. For bigger businesses trying to run more efficiently and compete with even bigger businesses. For non-profits, trying to raise funds for worthy causes. They do it for the people in those organizations. Very soon we are going to release our first About Us video, introducing our team to anyone who wants to get to know us a little better. You'll hear from employees and clients of GreenRope in unscripted honesty. You'll see firsthand why we care so much about you, and what we believe makes us special. Am I prejudiced against our competition? You bet I am. 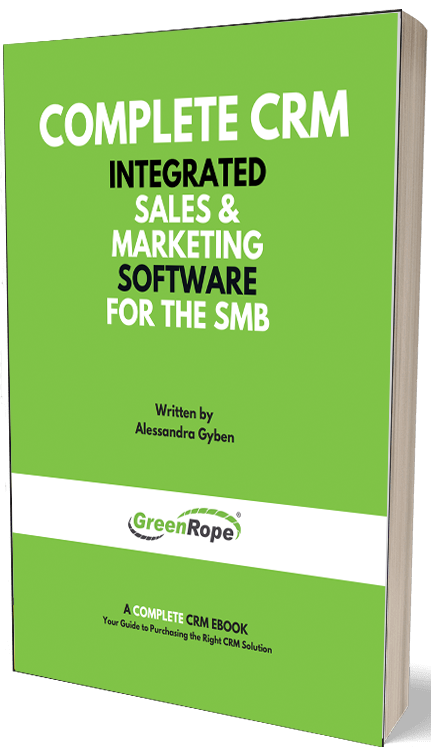 There are, without a doubt, a myriad of other CRM and marketing automation companies out there. But we wouldn't be here if we didn't think we could do it better than they do. We are small, agile, and customer focused, and in the last 15 years, we have built software that I believe is better than anything on the market. Prideful? Yes. Prejudiced against our competitors? Yes. About to fall? No. In 2010, at a conference in San Diego, I unveiled our vision and the 200 people in the audience unanimously agreed that what we were trying to build was impossible. There was no way we could compete, given the size of our company and the idea that one piece of software could manage an organization's sales, marketing, and operations. At that time, I was shocked at the lack of faith of the industry and businesses leaders in that room. But like most entrepreneurs, when someone says they don't believe something can be done, I looked at them all and said that we WILL do it. That was a fateful day. One of our competitors was in the audience and said we were headed for certain and epic disaster. Fortunately, for us, that never happened. Unfortunately for them, we have grown and hear every week how happy clients are that they left that competitor to use better software. As a business owner, I do not believe pride in one's business and prejudice against one's competitors is a bad thing. In fact, I think it is something that helps a business unify in vision and succeed. Stay the course, embrace your pride and your prejudice, and keep fighting the good fight!